Tonight before Maggie's party, Teena and I went out for supper with our friends, Malcom, Mary and Tom, to Jack Astor's in Stoney Creek. When I opened the menu to look at the beer list, I was not expecting anything exciting, but there it was. This week's beer of the week, Mad and Noisy, Hops and Bolts IPL. I asked our server, Justin, who made it but he did not know. He did know who was responsible for the new food items on the menu, a friend of his, but not the beer. 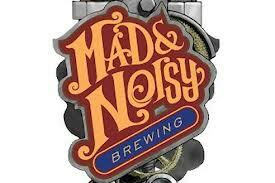 Mad and Noisy is really a brand line and not a brewery so I am not counting it under the number of breweries profiled. It is the brainchild of Creemore Springs Brewery but this beer is not listed on their website, nor does the brand have its own website yet. The beer is a light coppery colour and as you can see is pretty clear. When I sipped on it, there was a good amount of lacings left behind on the glass. It is a decent hoppy beer. Not an overpowering hoppy beer but a beer that you know that hops have been used. I had another couple before I left. Currently it is only available on draft but if they sold it by the bottle or can, I would certainly be buying it. Note from November 30: I was at Six Pints brewing Academy and they had it on tap... so I had a couple. A very enjoyable beer!